Dipping at an alarming rate, India's solar tariffs recently reached an all-time low of Rs 2.44 per unit. Will it hurt the renewable sector? They say the rate at which solar tariffs have dropped in the past two years is unhealthy (see ‘Ready to charge’). They also fear that the tariff is so low that the project might not be feasible. The bid tariff is 45 per cent lower than the cheapest solar power available in the country this time last year. It is also comparative to the Rs 2-3 per unit average tariff of Ultra Mega Power Projects, set up with the most efficient technology to optimise electricity generation from coal. They agree the Centre’s interest in solar parks is responsible for the increased competitiveness in the sector. In February 2017, India revised the share of solar parks in the 100 GW solar target from 20 per cent to 40 per cent. The Ministry of New and Renewable Energy’s decision to use reverse bidding for solar projects has also pushed the tariff down. Reverse bidding is an auction process in which sellers offer to generate electricity at the competitive prices, which the buyer chooses based on the lowest bid. The bidding happens under conditions defined by the buyer. Besides the government push, several reasons could have allowed the company to bid so low. For starters, solar photovoltaic modules are becoming cheaper by the day. As per pvxchange.com, the module prices crashed from €1.95 ( Rs 150) per Watt-peak (Wp) in March 2010 to €0.46 ( Rs 34) per Wp in April 2017—a decline of 76 per cent. The price of the modules has reduced by almost 20 per cent since January 2016. This has brought down the capital cost of setting up a solar photovolatic plant. According to the Central Electricity Regulatory Authority, the capital cost for setting up a MW of solar park has reduced from Rs 16.9 crore in 2010-11 to Rs 5.3 crore in 2016-17. As per Delhi-based non-profit Centre for Science and Environment, (CSE), photovoltaic modules account for 62 per cent of the plant cost. “Since modules are the last equipment to be installed, the capital cost for the bids have been estimated based on the projected module prices at the time of commissioning the project, which will be at least a year from now,” says Raghunath Mahapatra, head-strategy, Avaada Power. There are some industry estimates that suggest the price of modules will continue to decline by 20 per cent annually till 2018. The location of the Bhadla Solar Park can also help. "Irradiation levels in Rajasthan are higher than in other parts of the country. 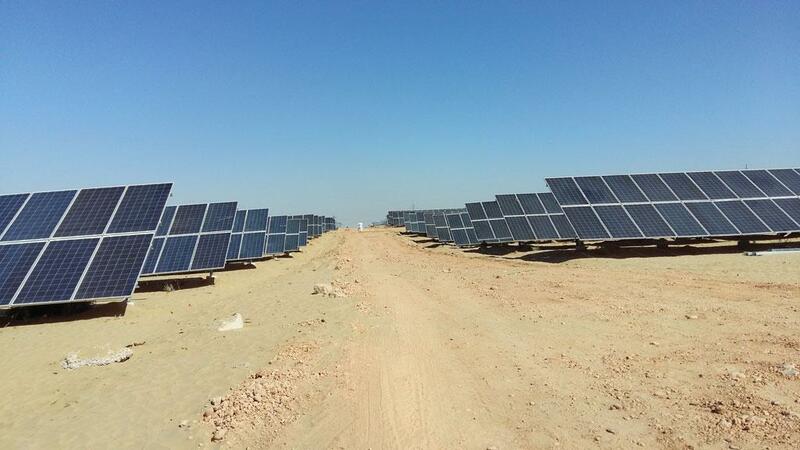 We expect a minimum plant load factor (PLF) of 22 per cent compared to 19 per cent in the rest of India," says Bibhu Biswal, vice-president, Saurya Urja Company of Rajasthan Limited, which manages the 500 MW ILF&s park inside the Bhadla solar park. He adds that Jodhpur district’s average solar irradiation levels are around 5.63 kWh/sq metres, compared to 5.17 kWh/sq metres in Rewa, Madhya Pradesh, which received the lowest bid before Bhadla of Rs 2.97 per unit. "In our estimate, the three per cent of difference would have an impact of around Rs 0.50 to Rs 0.70 per unit," says Biswal. Another advantage with the Bhadla solar park is that public sector undertaking Solar Energy Corporation of India (SECI), which works under the Ministry of New and Renewable Energy, has agreed to buy the generated electricity. Given the dire financial condition of the distribution companies, this move protected the projects from the risk of non-payment from these discoms. Increasing foreign investment in India’s solar sector could be another reason, say experts. The country has become a solar hub as international developers want to enter the market, sometimes, even at the cost of suffering losses. As per the latest Ernst and Young renewable energy country attractiveness index report, "China and India have surpassed the United States to become the two most attractive countries for renewable energy investment." Two of the four developers who were awarded the bid to set up solar plants worth 450 MW in the III and IV phases of the Bhadla solar park were foreign players. Besides Avaada Power and Acme Solar, the project was bagged by South African firm Phelan Energy and Japanese investor Soft-bank Cleantech. The Japanese firm won bids in both the phases of the solar park, for which developers from Finland, France, Saudi Arabia and Singapore participated. While the Rs 2.44 target is theoretically possible, it is unlikely to be profitable, say experts. They warn that such low pricing will have an adverse impact not only on future solar biddings, where the government will expect lower prices, but also other renewable sources. According to CSE, to arrive at the Rs 2.44 tariff, the capital cost of the project would be around Rs 3-3.5 crore per MW at a PLF of 22 per cent. The interest rate on debt would have to be much lower than the commercial lending rate of 13 per cent and the return on equity would have to be 12-14 per cent, compared to the standard 20 per cent that is assumed. However, the internal rate of return (IRR), a measure of profitability, will be too low for the project to be viable. A February 2017 report released by credit ratings agency ICRA concludes that IRR of a solar project with a tariff of Rs 3.3 per unit would be just 11.5 per cent, whereas the average industry expectation is around 18 per cent. The report assumed that the project will have a capital cost of Rs 3.7 crore per MW, and a PLF of 23 per cent, both are higher than what will be the case in Avaada. Experts warn developers will not invest in other renewable energy sources, especially wind. Currently, India's average tariff from wind energy is Rs 3.50 per unit. Jasmeet Khurana, associate director, Bridge to India, highlights another problem when she says, "There is new risk for projects that were bid for in the last year. 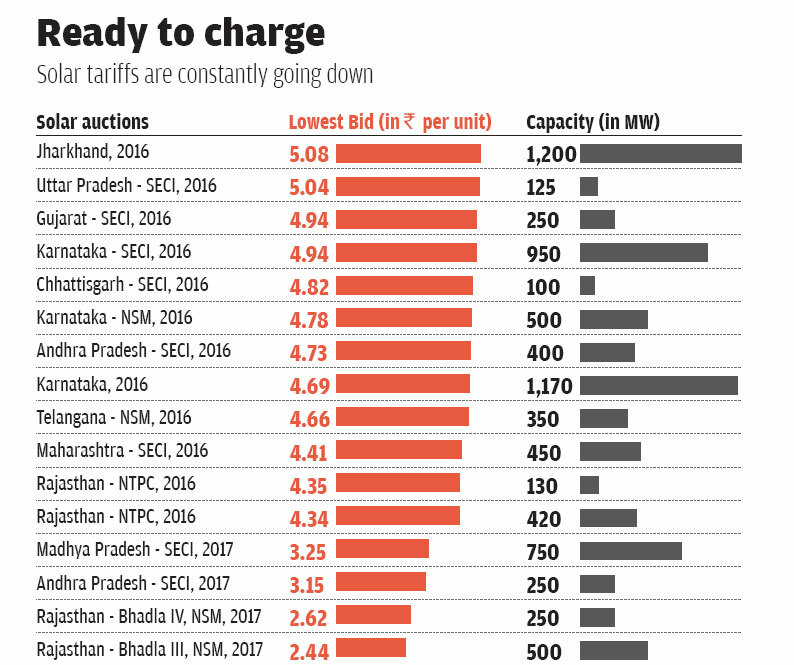 States may become reluctant to sign power purchase agreements with higher tariff. Not only that, for the upcoming projects, policy makers would be updating policy and tender requirements to match the guarantees offered that helped garner such low tariffs."